Every year around this time, I have to make a decision regarding my Hibiscus rosa-sinensis plants: To prune or not to prune. Pruning this early in the year will insure that they will recover enough to start blooming in late spring/early summer. 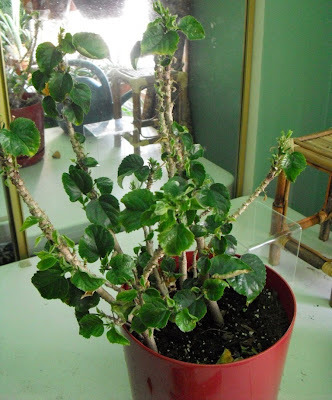 Although it is generally considered unwise to prune houseplants while the days are short and the sun is still relatively weak, I haven't experienced any problems in that regard. Once the plants get going again, the foliage growth is quite vigorous. Last week, my orange-flowered cultivar was still blooming. And I was pleasantly surprised to discover that there was an tag buried in the soil. I bought this plant last summer, assuming it would be a NoId. The full H. rosa-sinensis 'Carolina Breeze' plant. It has a couple of unopened buds that will probably bloom during the next week. I have decided, even though it has lost a bit of foliage due to underwatering, (bad Karen; bad, bad Karen) not to prune this one this year. That means that it is likely to need it done next January. That brings me to my next two plants. I did not prune them last year, so they are due now. 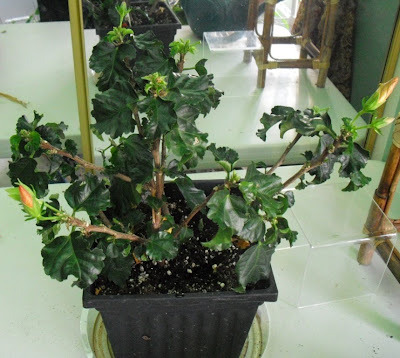 Second Hibiscus rosa-sinensis plant before pruning. Because they are unlabeled, I am not sure whether this is the red-flowered plant, or the yellow-flowered plant. This plant was not looking bad, so I pruned it conservatively. 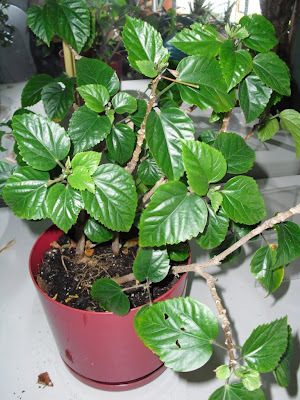 The same plant as the one immediately above, post pruning. I expect it to leaf out nicely. This third plant is another story. The soil got so dried out that many of the leaves became too dessicated to recover. This most likely because it is underpotted and because it, like all the Hibiscus, is in the spare bedroom, which I don't visit every day. Add this to my less-is-more watering style, and it turned into a recipe for disaster. Third plant, pre-pruning. Note the lengths of bare stem between the top and bottom growth. Another view of a bare stem. This was originally covered with leaves. 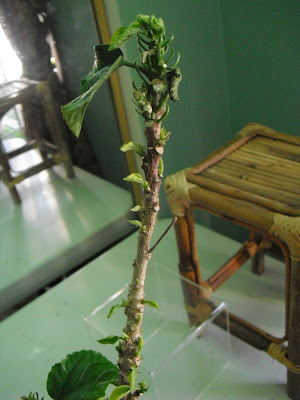 All is not lost; there is already new growth appearing along the stem. 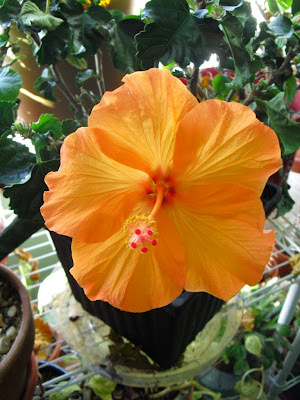 I also have a fourth Hibiscus, with double peach flowers. That one was drastically pruned last year, after having been attacked by Japanese beetles in summer 2008. After being cut down to nothing, it rewarded me with vigorous growth and beautiful flowers, as seen in the first photograph of this post. I hope my other plants will do the same this summer. I vow to be a better plant parent and keep up with the watering. Edited to add at 4:30PM on 1/8/10: Be sure to click the first photo to see it enlarged. It is definitely worth it! 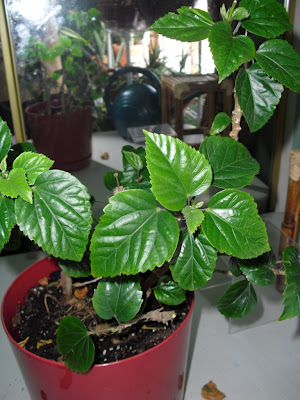 Although this blog is (mostly) about my houseplants and garden, it is also about my life. (You've been warned.) 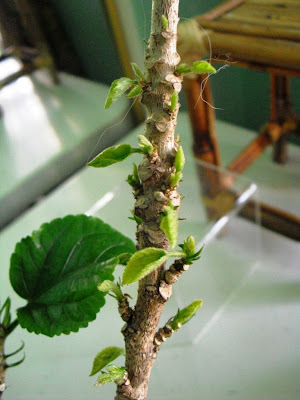 While I hope that at least some of what I write is of practical interest, the main focus of Life Among the Leaves is on the feelings inspired by growing and caring for plants. Karen715 is a New Yorker relocated to the Midwest. As such, she maintains that the proper name for sweetened carbonated beverages is Soda, not Pop. She lives among the leaves with her loving husband and a mischievous cat. On occasion, she has been referred to as a "Crazy Plant Lady," an epithet she embraces wholeheartedly. All photos on this blog, unless otherwise credited, are the work of Karen715.